I don't typically use box hair dyes but I was desperate because I had to cover some whites (yes, I have white hairs!) and I couldn't get an appointment with my hairdresser. My hair actually came out very very dark brown, there was nothing light or golden about this color. I actually really love the color though and now I want to keep my hair dark. 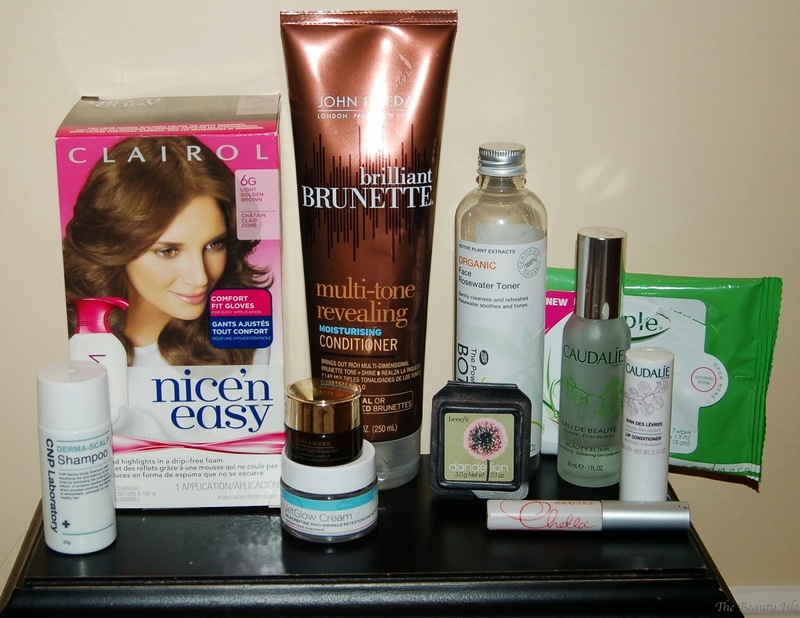 I've used Brilliant Brunette products over the years and they are fine. Nothing special at all but I buy them when they're on sale and I have coupons. This is no better or worse than any other drugstore conditioner that isn't specifically for brown hair. I got this from Target and it lasted me forever. I liked the nice rose scent of this toner and it did a good job at getting off the last bits of my makeup. I think this was around $8 so I won't repurchase because it's really no better than a regular drugstore toner. I've had these in so many empties and I'll say it again, these wipes aren't that great for the face but they're fine for when I want to wipe swatches off my arms. I got this in a Memebox. This is supposed to exfoliate the scalp which I didn't know was necessary. It does contain and smell like methol but it also has a rotten musty smell to it so I didn't like that. It also made my hair feel very dry. Usually when I have a face wash or shampoo I don't like to use on myself, I save them to use to clean my makeup brushes. I won't even subject my makeup brushes to this stuff. This is a wonderful skin brightening cream. I noticed results right away. You can read my review of this product HERE. This blush was fine. It was a little light for me so I had to use a lot. Even though I used a lot this little sample lasted me over 5 months. I was so over it by the time I finally finished it! I wouldn't purchase this for myself. I think I got this in an Ipsy bag. My eyebrows are pretty unruly and this didn't help that out one bit. I wouldn't buy this for myself. I loved the soft velvety feel of this eye cream. This sample lasted me a couple of months and I didn't notice any difference to my under eye area so I wouldn't repurchase this. I got this and the next product in a Caudalie favorites set from Sephora. This is a nice lip balm but nothing special. It costs $12 and I would absolutely not pay that for this. What the heck is a beauty elixir?? I tried to use it as a toner which it worked fine as. It has a strong herbal scent mixed with a musty attic smell. I've read that people like to use this as a face refresher through the day. Is this true? Why would you spray anything (besides a setting spray) on your fully made up face? Maybe at the beach in the sun? I don't know. This product confuses me. So that's everything I used up this month. I had some loves and some things that I'm glad I tried and know that I will never try again. Have you tried any of these products? Scheduling Note: I just wanted to give my readers a heads up that you may not see as many Frugal Friday posts from now until the end of the year. I have a lot of reviews of popular holiday gift items I want to share with you as well as end of year favorites. There will be some FF posts, just not the same every other week posting schedule as before.